At the end of this season’s première, I was optimistic about this show’s shift in the status quo, but this week’s episode exposes the problems with relying too heavily on the fantasy side of the storyline. The Emma-centric “Tallahassee” features almost no Storybrooke, focusing its time on Emma’s romantic adventures up the beanstalk with Captain Hook. 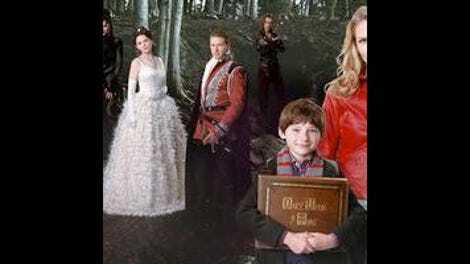 It’s a wheel-spinning episode, despite the reveal that a character who appeared for five minutes in “Broken” is Henry’s father, who didn’t die in a fire like Emma said. He also wasn’t a firefighter, but instead a thief, and the events in this week’s episode lend credence to the theory that he’s Rumpelstiltskin’s son Baelfire. “Tallahassee” is the first big misstep of this show’s second season, with a flashback that tries too hard to be Lost and fantasy sequences that are crippled by this show’s limited special effects. Once Upon A Time is not Lost. The latter succeeded because it was able to flesh out its characters and make them real people trapped in fantastic circumstances, but OUAT is the exact opposite, transplanting characters from fantasy to reality. The fairybacks serve the same purpose as Lost’s flashbacks/forwards/sideways, attempting to flesh out the human side of these characters, but the fairy-tale environment actively works against that goal, especially when this show loses sight of the limitations that a network-television budget puts on storytelling. I don’t know if there have been any episodes that have been as negatively affected by this show’s lacking visuals as “Tallahassee,” which features some incredibly sloppy green-screen work. Emma the Giant Killer could be fun, but it’s played so seriously that it ends up becoming something akin to a Disney Channel original movie. The episode begins with Emma, Hook, and company at the beanstalk, where Hook tells them the true story of Jack and the war between giants and humans over magical portal beans. How is it possible to have so little fun when that is part of this show’s mythology? Emma chooses to accompany Hook up the beanstalk, given a bag full of powder made from poppies (uh…opium?) courtesy of Mulan to protect her from the raging giant at the top, who is the last of his race. While climbing up the beanstalk, Emma stops to have a heart-to-heart with Hook talking about romance—an attempt to create some chemistry between the two that feels hokey and out-of-place. He wants to know about her past loves, to which she says she’s never had any, although the flashback tells us differently. The man who appeared back in the season première is Neal Cassady, a small-time thief who finds himself entangled with a 17-year-old Emma when she steals the car that he stole earlier. No matter how many ponytails and glasses Jennifer Morrison has thrown on, there’s no way she can pass for 17, but she tries to capture some of teenage Emma’s youthful energy and naïveté in her relationship with Neal. That said, she needs to try harder. The flashback is a stereotypical young, nomad romance, with idealistic Neal making plans to settle down with Emma wherever she chooses. She chooses Tallahassee, which is in Florida so it should be by the beach, and those are always fun. Then Neal finds out there’s a warrant out for his arrest for stealing watches, and rather than see her relationship end, Emma tells Neal that she’ll go to the train-station locker where he stored the jewelry and grab the watches so that they can sell them and finally start their new life together. The flashback doesn’t have the dramatic punch that it should, but it fares much better than the abysmal scenes of Emma, Hook, and the Giant, played by Lost’s Jorge Garcia. Garcia is a strong actor when he’s performing with actual people, not just yelling at his fist against a green screen, and he’s completely nonthreatening as a killer giant. The episode’s worst special effects come when Emma and Hook first reach the top of the beanstalk, encountering the Giant in the middle of some environments that look like they were lifted from Myst for Windows 98. The effects would probably look a lot better on a television from 20 years ago, but in this world of high-definition, the shoddy quality of the visuals distracts from what is supposed to be an intense situation. An emo Captain Hook banging on a giant shield with a bone is already a hard sell, but when you put it through a filter of bad CGI, it becomes laughable. Once inside the Giant’s den, things don’t get much better, and despite being on a tight timetable, Emma and Hook continue to stop and talk about their emotions while looking for the enchanted compass. There are giant stacks of coins everywhere because they’re easily reproduced digitally, and when the Giant wakes up from his opium sleep, he comes charging and knocks all those coins to the ground. It’s supposed to be the big special-effects money shot of the episode, and while the show deserves kudos for trying to push what a network budget is capable of, it would be a much stronger series if the writers instead wrote stories that understood those limitations and crafted plots accordingly. The Giant gets Emma in his grasp, but she escapes by biting him, then captures him in his own booby trap. The Giant fears for his life, and Emma learns that the humans were the merciless killers in the war; when she doesn’t take the man’s life, he gives her the compass for being so nice. Now in possession of something that can help her get home, Emma handcuffs Hook and gets a head start on the duplicitous pirate because the chase is the fun part in these budding courtships. After this week’s episode, here’s hoping Emma finds her way back to Storybrooke sooner rather than later. While all the Emma action is unfolding, Snow White and Aurora have a subplot thrown in that illuminates the episode’s cliffhanger. Aurora has been having horrific nightmares whenever she tries to sleep, which Henry also seems to be having in Storybrooke. Isn’t your interest for next week totally piqued? The promo for next week’s Ruby werewolf episode is backed by a dubstep track, because nothing says “supernatural thriller” like dubstep.